Learn various integrated cloud services like analytics, computing, database, mobile, networking, storage and web. This course will give you a thorough understanding of Microsoft Azure services like Compute, Storage and Network. This course will give you an advanced insight into different services of Microsoft Azure specially on Azure Active Directory, Database Services like Azure SQL and Cosmos DB, Advanced Application Designing, Configuring Template driven Deployment, Azure Machine Learning, implementing various kind of workloads on Virtual Machine, Identifying Automation and Monitoring Strategies using Azure Services through hands-on instructor-led delivery model building upon the Cloud Computing with Microsoft Azure – Level 2 training. This course focuses on designing and implementing Cloud Data Platform Solutions on Microsoft Azure cloud by using SQL Server on-premises, SQL Server on Azure VM, Azure SQL, and Hybrid solutions where both on-premises and Azure cloud are used. This hands-on course is designed to get knowledge to be able to clear the 70-473 : Designing and Implementing Cloud Data Platform Solutions Exam. This course focuses on designing and implementing Big Data solutions on Microsoft Azure Cloud by using various services like Azure Event Hub, Azure HDInsight, Azure Data Factory and many more. This hands-on course is designed to get the knowledge to be able to clear the 70-475: Designing and Implementing Big Data Analytics Solutions Exam. This course will provide you a beginner to advanced insight into different services of Microsoft Azure like Storage, Virtual Machines, Websites, Cloud Services, Azure Active Directory, Virtual Networks, Backup & Site Recovery through a hands-on instructor led delivery model. This course aims to prepare candidates for the Microsoft Azure Exam 70-533: Implementing Microsoft Azure Infrastructure Solutions. This course will give you a beginner to advanced insight on different services of Microsoft Azure like Storage, Virtual Machines, Web App, Azure Active Directory, Virtual Networks, Designing Advanced Application Solutions with IoT Hub, HDInsight, Machine Learning and HPC pack. This course aims to prepare candidates for the Microsoft Azure Exam 70-535: Architecting Microsoft Azure Solutions. There are no current batches available. We will announce the batches soon. CloudThat trainers are Industry experts into Training and Consulting, having profession level certifications from Amazon which makes them part of few select people who have this certification. 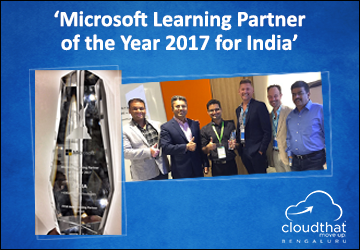 Their ability to translate complex technical concepts into simple and streamlined delivery has helped numerous people to learn and get certified from Azure. CloudThat was co-founded by Ex Amazon and Ex Microsoft employee in the year 2012. We are leaders in Cloud & Big Data training and have trained over 7000 professionals. Our training clients include some of the Fortune 500 companies including Yahoo, Akamai, Intuit, Philips, Samsung, etc. CloudThat also has a consulting team that helps our global clients with Azure expertise by working on large and complex cloud infrastructure. Our consulting experience makes us even better trainers which has been repeatedly mentioned by various training participants.